About the presentation: Leading supply chain organizations use true demand to increase service levels and grow sales. Especially as omni-channel commerce increases complexity and retailers put increasing pressure on consumer goods companies, managing to end-customer demand is key to keeping up with a fast changing market. Developing a single source of truth across your supply chain can help you strengthen your relationships with internal and external partners, and quickly collaborate to respond to the market, avoiding out-of-stocks and over-stocks. Join us to learn why downstream sales and inventory visibility is critical to best-in-class supply chain organizations, and how you can start (or accelerate) leveraging it efficiently to gain a competitive advantage. We'll share best practices for advancing from data ingestion to predictive analytics to decision-making, like forecasting and product launch management. 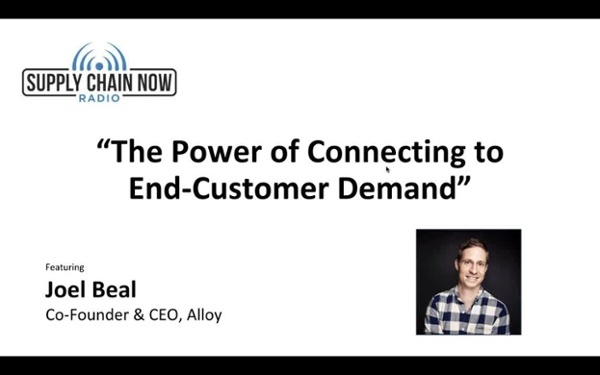 About the featured speaker: Joel Beal is a co-founder and CEO of Alloy. Prior to Alloy, Joel was VP of Product at Addepar, a financial analytics company, and has also worked at Applied Predictive Technologies, which specializes in business analytics software for large, consumer-facing businesses. He holds an M.A. in economics from Stanford University, and a B.A. in economics and mathematics from Columbia University. About the host: Scott Luton serves as Managing Partner for TalentStream and is a member of the ownership group. He has worked extensively in the end-to-end Supply Chain industry for more than 15 years, appearing in publications such as The Wall Street Journal, Dice and Quality Progress Magazine. Scott has held a variety of leadership roles with organizations, with significant experience in the manufacturing and professional services sectors. Scott currently serves as Executive Vice President of APICS Atlanta and was also named to the 2018 Georgia Logistics Summit Executive Committee. He is a graduate of the University of South Carolina, is a certified Lean Six Sigma Green Belt and holds the APICS Certified Supply Chain Professional credential. As a Veteran of the United States Air Force, Scott also volunteers as Co-Chair of the Business Pillar for VETLANTA, and maintains active membership in the Georgia Manufacturing Alliance & CSCMP Atlanta Roundtable. He founded Supply Chain Now Radio in 2017 to spotlight the best in all things Supply Chain. Connect with Scott Luton on LinkedIn and follow him on Twitter at @ScottWLuton.